While your wedding may be the most important and biggest event you have planned this decade, your guests may already be planning their next beach getaway for that same date. With busy schedules and travel often involved, Save the Dates have gone from a “nice to have” to a necessity. 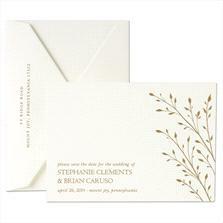 If your wedding has been planned far in advance, you can send these out 6-8 months before your date. One important consideration, however, is to make certain that everyone getting a Save the Date is someone you want at your wedding! If you’re on the fence about a guest, it’s better to leave them off this list and just invite them when you send out your wedding invitations . Sure you could e-mail all of your friends and family with the heads up, but Save the Date cards are inexpensive and a lot less tacky than a mass e-mail! That begs the question, “Other than the date, what should go on the card?” Think of a Save the Date as a scaled down invitation. You want to make sure you have the Who, What, When and Where. There are a couple of other things you may want to consider including on a Save-the-Date. If you’ve created a wedding website, this is a great place to tell your guests about it. Also, if you have a lot of out of town guests and you’ve reserved a block of hotel rooms, go ahead and share the details. You can give more specific information about the hotel(s) on your website, but it’s wise to first mention it here. Waiting to include that info on an enclosure card with your actual invitation may turn out to be too late. Save the Dates can also set the tone/theme of your wedding (e.g. color schemes), so you may want to give that some consideration as well. Have fun with it! Some companies worth looking at are William Arthur, Crane, Carlson Craft, Elum and a new fun printer–Kramer Drive, just to mention a few. Feel free to contact us at info@partypanache.com and we will be happy to guide you through this process as well as inform you of special offers.